My great grandmother, Myra Salmon, raised up my beloved grandmother Kitty in St. Louis, Missouri. My great grandmother was friends with another St. Louis native, Irma Rombauer, the woman who wrote The Joy of Cooking. Despite their friendship, Myra was not a good cook. Much as she tried to make something tasty for Irma at one tea party after another, things always went disastrously wrong. Eventually, it was clear that the best thing Myra got from her friendship with Irma was some good lines. This was because Irma larded her cookbook with a lot of funny remarks. The early editions of The Joy have wonderful quips in them. Later, one of Irma’s children edited out most of this humorous stuff. Sadly, this child seemed to think cooking had to be SERIOUS BUSINESS. I am grateful that I have my grandmother Kitty’s copy of The Joy. It’s full of Irma’s quips and also my grandmother’s own funny remarks penciled in. 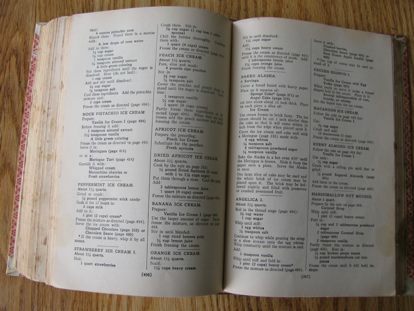 Because The Joy was my extended family’s most depended upon cookbook, many of Irma remarks about food became family shorthand for how to live, as well as how to cook. One dessert from The Joy in our family’s repertoire is Fudge Pie. As Irma said in the 1936 edition of The Joy, “(Fudge Pie) is deliciously and devastatingly rich. Do not let that deter you.” Apparently my mother listened to her advice because throughout my childhood we had Fudge Pie about once a week. Us kids thought of it and dessert in general as something to be embraced, not ignored. Yes, we had plenty of healthy desserts too, mostly something we called, “Fruit Compost,” a dry fruit salad that tasted as good as our name for it, but room was made for deliciously rich desserts as well. Sometimes when I find myself writing this blog about silly stuff like Fudge Pie or ham, I worry that perhaps it is wrong to write about my small life when such big sad things are happening in places like Haiti. As I wrestle with this, I remember another part of my family’s history with ham. When I was fourteen, Kitty, my marvelous grandmother, died unexpectedly. It was my first time through that territory of all life stopping while all life continued on. My grandmother was all about seeing the silliness, the joy, the fun, and the pizzazz in life, yet here we were stopped in our tracks by the grief of her loss. In the first of her many beyond the grave activities, my grandmother lightened the mood of her funeral week in her signature humorous manner. She addressed the issue of her immortality and the whole big picture topic of eternity by using hams as her metaphor. In the days after she died at least a dozen people left off a ham at my childhood home and then when we got to Grandma’s house for the funeral, there were more hams. On every flat surface there was another ham, lovingly cooked by one of Grandma’s friends. My grandmother was not noticeably big on hams so people weren’t bringing hams because Grandma loved them. As more and more foil covered hams arrived, it became clear that Grandma was orchestrating this humorous ham assault for another reason. By somehow prompting each of her friends to bring a ham to her funeral, Grandma spoke to us in The Joy language we all shared. She was showing us that eternity was as close as the hams under our noses and that she was still there, laughing with us. This memory is such a reminder to me that we don’t know what our small kindnesses actually accomplish or their significance to others. When we follow our heart promptings we have no idea how we’ve helped. The loving gesture of each friend’s gift of a ham ended up deeply comforting everyone in Grandma’s family on more than the most obvious level. No one individual knew what a consoling message their ham would bring when combined with all the other hams, only that it felt like the right thing to offer up. Tragedies like Haiti can make us feel dis-empowered, overwhelmed, and hopeless about making a difference. But the truth is, the small kindnesses within our power to accomplish like a smile to a stranger or ham at a funeral do make a difference- often much more of a difference than we will ever know. Remembering the profound gifts of the ham assault, I know every tiny heartfelt kindness MATTERS and in a big way. When I feel upset that I can’t do all that George Clooney can do to help in Haiti, I remember that we are all one pond so if I try to clean up my part of the pond with small acts of kindness in my daily life then the whole pond gets cleaner and everyone is impacted. Plus I have no idea how many other people are joining me in the pond clean up. I really have no idea of the significance of anything. All I can do is go through each day doing what I can, doing what I feel nudged to do, doing what my heart calls me to do and then let go, knowing that God (and Grandma) will take it from there. My grandmother’s copy of The Joy of Cooking opened to Baked Alaska. 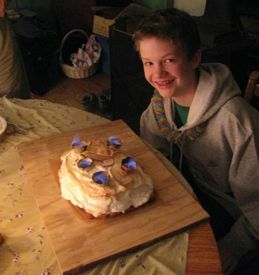 This was William’s choice for his fifteenth birthday dessert on Monday. Here we successfully flame the Baked Alaska making Irma, Myra, and Kitty proud. We Need Your Animal Photos and your input! One of our midwinter projects is to rewrite and reformat our Animal Wellness Collection brochure. Jess will do the actual layout. I am rewriting the copy. We hope to be able to put photographs of happy animal customers in the brochure. Much as we love our cats and dogs, we want YOUR beloveds to be represented too! We would LOVE you to send us your photographs of the animals in your life who have worked with and liked our Flower Essences. Please send your photos to our email address of [email protected] It would be great if you put something like Animal Wellness brochure project in the subject line- but no worries if you don’t. And please tell us who is who in the photos and tell us your name too. While we won’t put your names in the brochure, we may be able to put your animals’ names. Thank you for your help and support! This means we would love those of you who sent paper photos over the years to send new ones by email. We would love to put up everything we receive on Facebook and hopefully twenty two animals will be in the brochure, one for each Essence. If your animal benefited from one Essence in particular, let us know. We know these animal photos will make this a much more engaging brochure! I am rewriting the opening explanation of what Flower Essences are and why animals love them so much- I always find it very difficult to find accessible language. Your suggestions as I begin this task would be much appreciated. I also am trying to redefine each Animal Wellness mix since each has proven much more profound in its healing strengths than is suggested by these definitions. Please send us your feedback to the [email protected] so we can better clarify how each of these Essences serve our animals and our own health and well being. Just as I find all projects in the office much more fun when I remember to ask for help, it has lifted my heart to imagine the photos and suggestions you will send and how this will make this brochure so much better and so much more reflective of Green Hope Farm. From its first moments, it has always been a collaborative project. My husband loves a good project. In addition, he defines “vacation” as “the time to begin all projects”. After thirty years of vacations in which Jim keeps a circular saw in one hand and a tape measure in the other, you would think I would have anticipated this year’s project oriented holiday. But no, I never see anything coming, not even the obvious. Instead, with an unexpectedly successful homemade holiday behind us, I deluded myself that we were headed for a vacation week of little mess and deep relaxation. Then Boxing Day dawned. It is a day Englishwoman Deb and Bermudian Lynn have never been able to explain to me. Perhaps it means, “handymen start your power tools.” in anglo saxon. In any case, here at casa Sheehan, Jim announced on Boxing Day that he was going to makeover Elizabeth’s old bedroom into an office for himself. Until this vacation, when Jim said, “Meet me in my office.” we all knew to go to the pantry, stand by the washing machine, and await further instructions. And if he said he was going to spend an evening doing Green Hope Farm paperwork, we all knew he would settle into a desktop in the playroom about the size of that miniature rug I made for Ben. So yes, a real office was long overdue for the guy and I got behind the project in a naive, misty eyed sort of way. Besides, it sounded like a low key project, something he could putter away at while the rest of us read books and ate stale holiday treats. The only problem was that I had been using Lizzy’s room as a place to store my enormous yarn stash and I was not the only person using the room for storage. Every last child’s book, stuffed animal, toy, or gizmo lived there. There were bins and bins and bins of legos as well as a surprisingly large collection of dress up costumes, circa 1989. The room also housed the girls’ vintage coat collection, a collection so extensive that Rachel Zoe would have been proud to call it her own. And in addition to all that yarn, there were the art, crafts, and sewing supplies as well as half finished quilts and other works in progress….. Well you get the picture. The room was packed and every last box of stuff needed to find a new home somewhere else in our house. One of the reasons why Elizabeth’s room had become a closet was because the guy who helped us design our house twenty five years ago was brilliant when it came to passive solar design, but not a big believer in closets. He felt anything in a closet was something you could live without. This philosophy always worked better for his bachelor life style than ours, but here we are living with his ethos two decades later. We have a house with very few closets, all of them overstuffed and children that will probably go on to build homes for themselves with immense closets ( either that or they will continue to leave their cherished mementos at our house). In any case, as soon as Jim began his project, the few closets in this house needed to be purged so we could find a new home from all the stuff from Lizzy’s room. How do you spell MESS? As the purge began, piles mushroomed everywhere. These heaps merged in the upstairs hallway with everything Emily owned, all of which she was sorting through before she leaves for a semester in Italy next week. The situation deteriorated further when Jim disassembled the enormous old bed in Lizzy’s room and Emily decided to she wanted this bed in her room. Her bed then needed to be moved to Ben’s old room and Ben’s old bed went to the barn. Not surprisingly, every time a bed got moved there was more stuff to be sorted. When there are no closets in a house, under the bed becomes valuable real estate for shoving miscellaneous stuff. And why weren’t we turning Ben’s old room into the new room sized closet? Oh that would be because it is already Ben’s home winery. It’s convenient to make wine for yourself especially when you can do it at your parent’s house and have their home not yours filled with the wonderful yeasty smell of living wine. So there I was enjoying my “vacation” on the floor of several closets, chucking out vital stuff like my fifth grade report cards. It all made me wistful for the orderly Green Hope Farm office. However, when I drifted into the office to escape the unruly mess in the house, I found that piles had temporarily gravitated into this space too. As piles multiplied, friends dropping in over the vacation week grew increasingly alarmed. As I tried unsuccessfully to find places for any visitor to sit, I noticed how swiftly a glazed expression would transform even the most cheerful face. I could see the frantic inner dialog, “When had the Sheehans become bag people? What forces beyond gravity were holding all these teetering piles in place? Was this what followed when a family opted for a “green” Christmas? And yes, I use the pronoun “I” deliberately here, because I was alone in this sea of piles. There were no cozy scenes of loved ones roasting chestnuts by the fire. Every last Sheehan but me had beat a retreat from the mess. Jim was shut away in his new office space, sanding and polyurethaning the new desk he had built himself. Ben and Lizzy had gone to ground in the quiet order of their own apartments, Emily had decamped indefinitely to a friend’s in Boston and Will was spending a suspiciously long time at the neighbor’s taking care of their cats and dogs. Yup. It was a Sheehan holiday at its finest. Mess, mess all around and no sound but the distant buzz of a power tool.